There isn't much to say about this one. It's just a slender horsetail that twists and winds its way down over exposed bedrock right in front of a town road. There are likely other falls upstream as well, but it's private property and a plethora of 'no trespassing' signs means us nature lovers simply aren't welcome. You'll only need to budget about 2 minutes of time to visit this one. 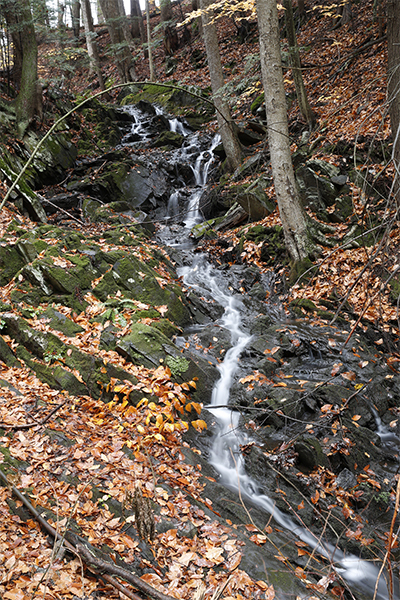 Views of the falls are limited to the road as the falls themselves are located on private property. On my last visit in 2016, there were several no trespassing signs in place. From I-91 in Brattleboro, take exit 3. Proceed east 0.1 mile to a traffic circle and take the first exit onto US-5 south. Follow US-5 south for 0.2 mile and turn right onto Black Mtn Rd. Drive 0.5 mile on Black Mtn Rd and take a left to continue on that road as Kipling Rd continues straight. 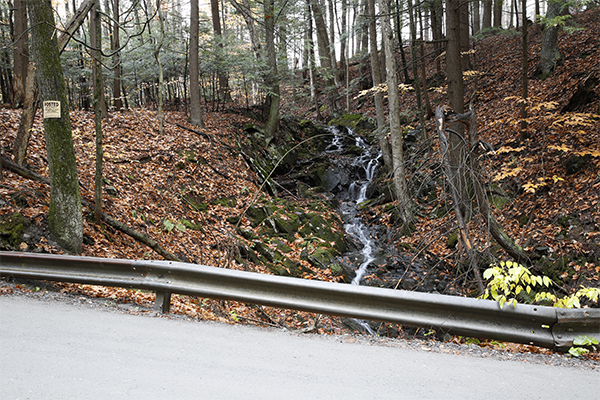 From here, drive 0.2 mile further on Black Mtn Rd and you will see the falls on your right when the road crosses over the brook. Find a safe place to park off of the side of the road.